The Spiral Bubble Counting Diffuser is a pollen style CO2 diffuser that connects to CO2 injection systems to easily disperse CO2 gas into the planted aquarium. The built-in spiral bubble counter allows for easy monitoring of the rate of CO2 injection. The inclusion of a bubble counter in the diffuser makes the use of a bubble counter on the CO2 tank or in-line unnecessary. The Spiral Bubble Counting Diffuser has a 30 mm disc. Compatible with 6 mm (1/4") - Standard Airline Tubing. Suction cup included. Rinse glassware with warm water. Attach suction cup and desired tubing (Compatible with 6 mm (1/4") - Standard Airline Tubing) to the diffuser. 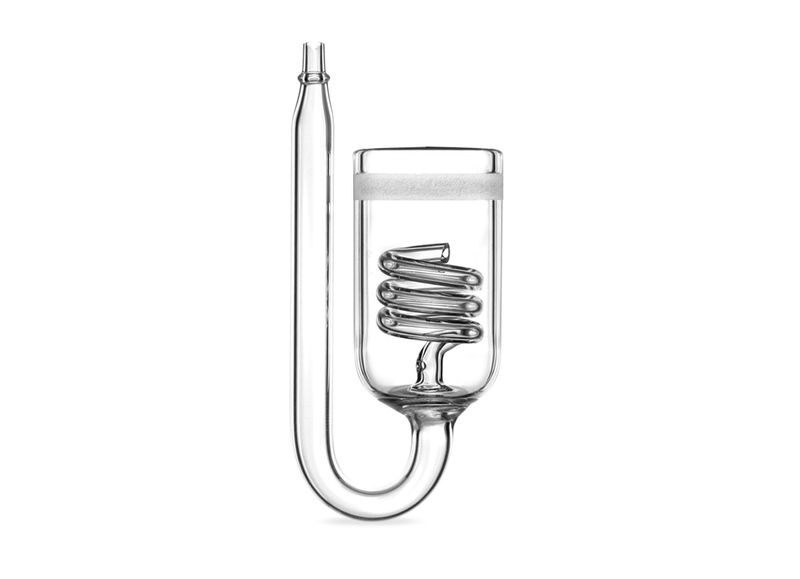 To attach tubing to glassware, wet the inside of the tubing with water at the attachment point and carefully slide tubing over glass. The use of other lubricants is not advisable as these usually make the tubing slide off of the glassware too easily. 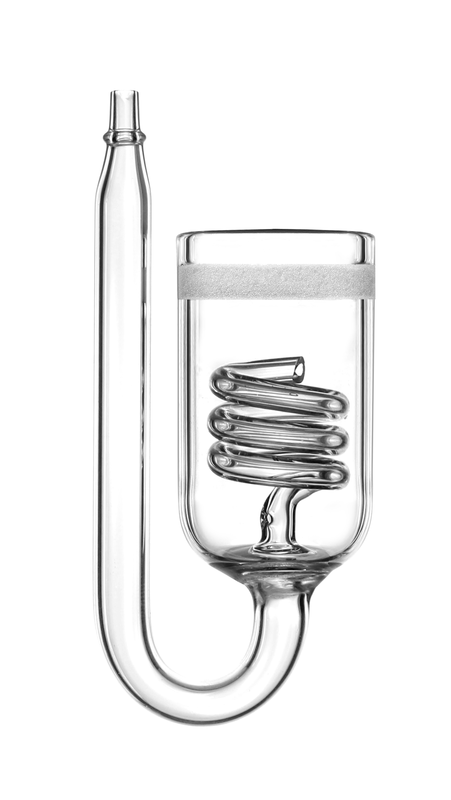 To avoid breakage when removing tubing, do not pull tubing off of glassware. Instead, cut tubing carefully along the attachment length to release the glassware. Mount your diffuser using the suction cup(s). It should be positioned low in the aquarium. When removing or repositioning the diffuser, pull by the suction cup(s) rather than the glass to avoid breakage. Once securely mounted, turn on CO2. Observe bubble count and adjust CO2 to desired flow rate. How do I determine the right flow (bubbles per second) for my setup? A: The exact bubbles per second will vary from system to system. It’s a good idea to start with about 1-2 bubbles per second and adjust according to CO2 concentration and utilization in your aquarium. Seachem recommends the Seachem Glass pH Checker to monitor CO2 concentrations in the aquarium; adjust the number of bubbles per second until the pH Checker remains green. How does the Glass Bubble Counting Diffuser compare to your Glass Spiral Bubble Counting Diffuser? A: The Spiral Bubble Counting Diffuser has a few benefits over the Bubble Counting Diffuser. First, and most noticeably, the Spiral Bubble Counting Diffuser is has a larger disc that makes it more suitable for large aquariums with high CO2 utilization rates. The “spiral” in the Spiral Bubble Counting Diffuser both adds an interesting aesthetic feature and makes bubbles easier to count as they pass through the spiral, especially when working with a high bubble count. I’ve installed my diffuser and turned on CO2. I am sure CO2 is flowing but I do not see any bubbles. A: First, check that your tank has a volume CO2 and pressure on the line via any gauges. Second, check any bubble counter in line to see if you have flow of CO2. Next, check for any kinks, blockages, leaks in the line. Lastly, it is often required that the unit run 24 hours before flow of CO2 is consistent. Please allow 24 hours of run time to see if there is a long-term issue. My glass diffuser was working fine, but the flow seems to have decreased. I have not changed the flow on my CO2. Is it clogged? A: It is possible in time that organics and algae can work to clog the very fine pores that CO2 must flow through. Remove the diffuser and perform a thorough cleaning. My diffuser has algae growing on it. How do I clean my diffuser? A: To clean a diffuser, generally soaking a unit in a very small amount of bleach and warm water overnight and then soaking in fresh water with Prime® or dechlorinator for a few hours is sufficient to clean away debris and algae. If this is performed without success a soak over night in water with vinegar may be necessary. Does disc diameter affect capacity? What’s the right disc size for my set up? A: A larger disc gives a greater surface area through which CO2 can be diffused, which can become important when trying to inject large volumes of CO2. Ideally, larger discs are used in larger or more heavily planted aquariums. Seachem provides recommendations for aquarium sizes on the diffuser and in the product description. For aquarium use only. Keep out of reach of children. This item is fragile. Use care when handling and removing suction cups and/or hoses. Dispose of broken glass in appropriate container.